In the Victorian era, jewellery was worn not just for ornamentation, it was often worn because it meant something to both the wearer and/or the people who saw her wearing the piece. Hands were a popular symbol. They could be clasped in love or friendship, or clasping items with their own symbology. 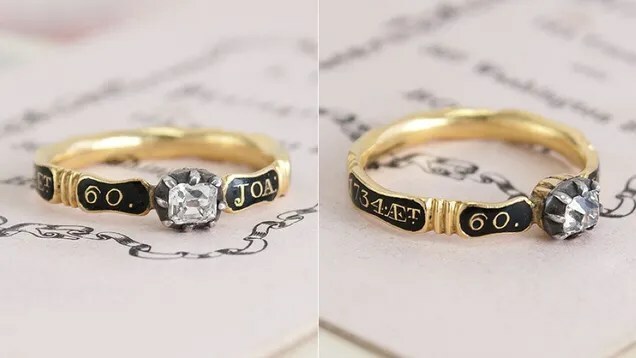 The ring below is an early Victorian-era Betrothal Ring, circa 1840. 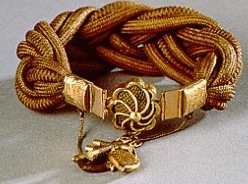 The Clasped Hands, which have a male and female cuff, open to reveal a gold heart on the central band. Flowers had a whole range of meanings, depending on the the types of flowers. Ivory hand clasping roses – symbols of love – and forget-me-nots. Ivory earrings clasping roses and forget-me-nots. Snakes represented eternal love or wisdom. A hand grasping a rod was seeking guidance or comfort in time of need. Mourning jewellery often depicted crossed hands, hands in prayer, or hands clasped ‘across the divide between life and death’. Victorian-era Whitby jet brooch depicting crossed hands. A hand clasping a key was clasping the key to a lover’s hear. This hand is clasping a key to a watch and was most likely worn as a watch fob. Note the use of tinted gold for the decoration. Pointing hands were charms of protection. It doesn’t take much imagination to see how this sort of jewellery could be used to intensify characterisation, or even become part of a plot point! 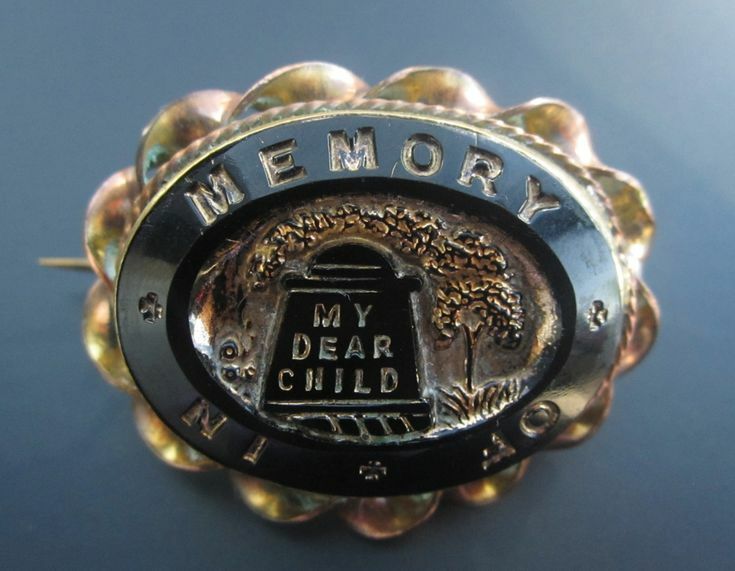 I have previously written about different types of symbolism of mourning jewellery, how pearls represented tears; and ivy represented fidelity; locks of hair from the deceased were incorporated into jewellery; painted miniatures of single eye surrounded by clouds and tears were symbols of a lost love; and – of course – there was jet carved into glittering brooches and beads for mourning jewellery. I haven’t even touched on the meanings of urns, angels, anchors and acorns (another day, perhaps). However, not every piece of mourning jewellery had to have a masked meaning. Some came right out with sentiments written onto the gems and jewels. 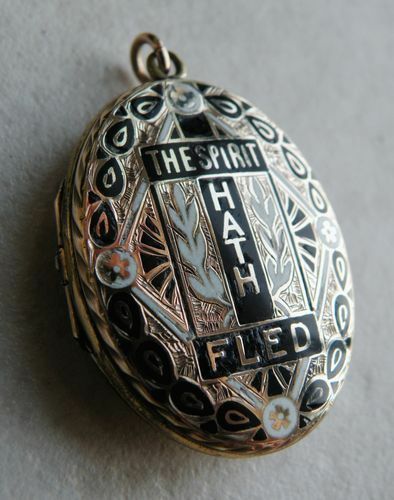 Lockets could contain messages, and often the messages were inscribed directly onto the item. 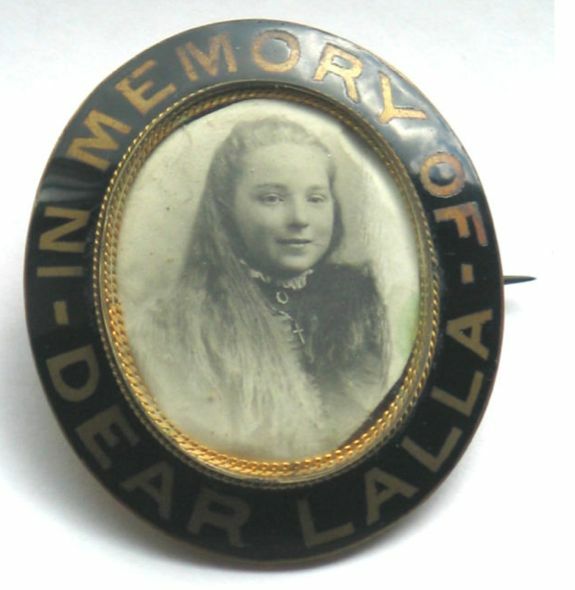 The personalisation of the mourning jewellery meant it had greater sentimental value to the person wearing it. A necklace of ivy leaves might be pretty, but a locket with a picture – worn close to a broken heart – has an added emotional charge. I know for a fact that the real value in a piece of jewellery is what memories it evokes, rather than if it is made of gold and rubies. 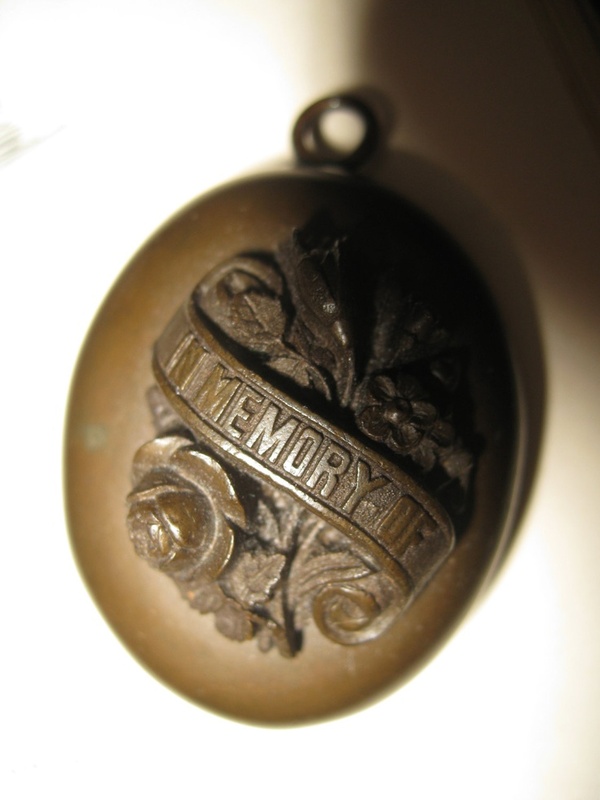 Sometimes a family would have mourning jewellery made up to hand out to chosen mourners at the funeral of the dearly departed, rather like party tokens, but with a much darker symbolism. Personally, I think the written mottoes and verses are sweeter than any other symbols, but it probably because I am a writer. 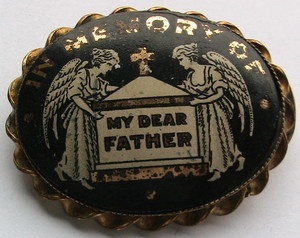 It is more specific to wear a brooch stating ‘My Dear Father’ than be dripping with mourning jewellery that could refer to anyone. Actually, this jewellery moves me much more than anything else I’ve shared before. I guess it is because I can relate better to a specific loss. I can understand the pain of the loss of a grandfather or a child. This is good thing to remember as a writer. If you want to touch your audience, they need specifics and not generalizations. Trigger Warning: If you are soft-hearted or have a weak stomach, please be aware that some of the images in this article are of deceased Victorian-era people. If you do read on and are offended, please don’t send me negative comments about the subject matter. This was an actual Victorian-era practice. 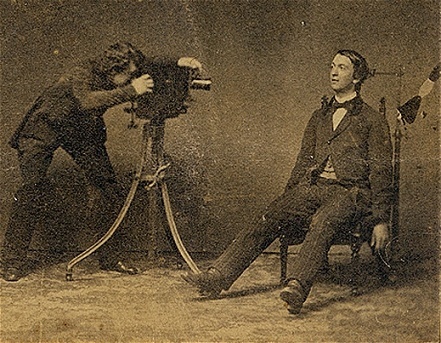 Photography was a new technology in the Victorian-era, and as with all new technologies there was some resistance to its acceptance. 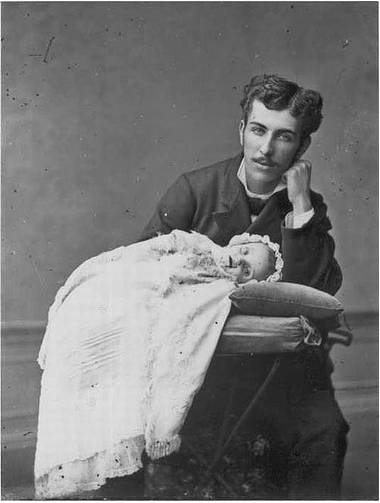 However, when a beloved family member died, and you had no photographs or any other form of portrait to remember them by, post-mortem photography became the last opportunity to capture their image. This might seem morbid or gruesome to our modern sensibilities, but the heart wants what the heart wants. —Her beauty made me glad. “But they are dead; those two are dead! 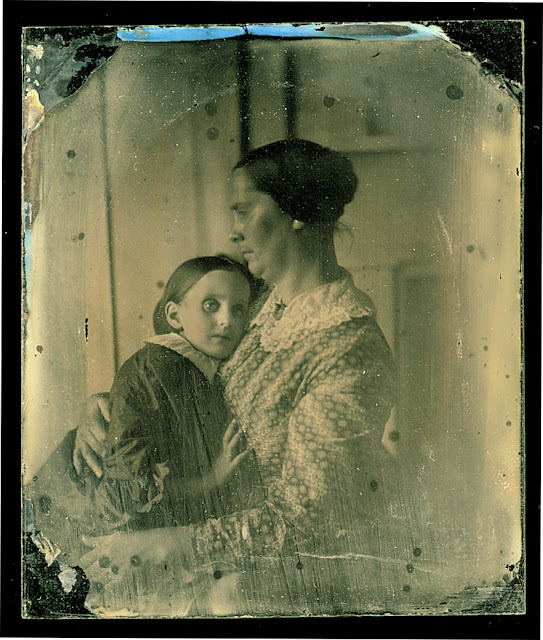 These photos were often the parent’s only portrait of their child, and the last opportunity to have a family portrait. The Victorian society might seem to have had many flaws, but they were clannish and often put the concerns of their family before anything else. Even though families were larger and the infant mortality rate was higher than today, this doesn’t mean that Victorian parents didn’t deeply feel the loss of every child. 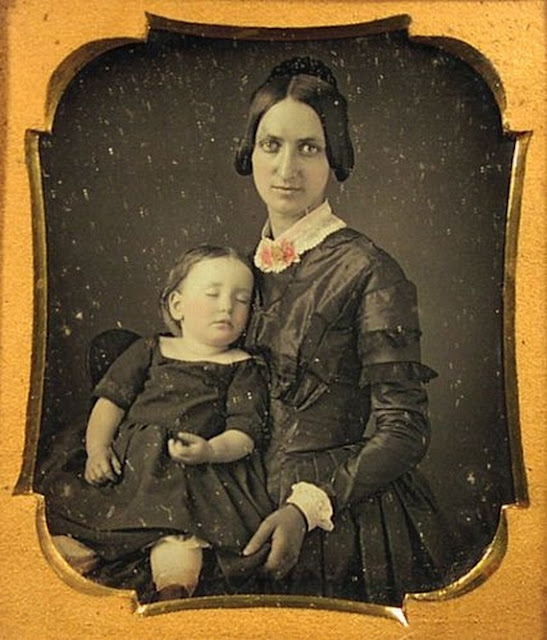 Indeed, I see post-mortem photography as proof that parental affection hasn’t changed over the centuries. You can see the real grief in the faces in these portraits. This is the last chance to have a keepsake of their precious child. 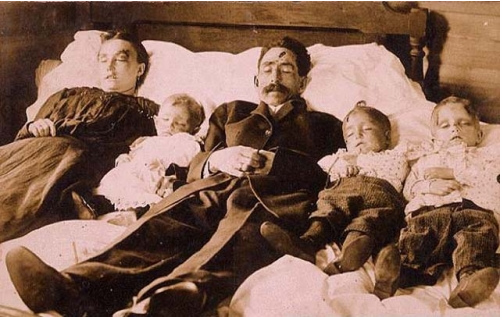 These photographs were not made for any macabre purpose, or because the Victorians were morbidly obsessed with death. These were people taking advantage of a newly introduced technology to help soothe the pain of loss. The tragic loss of an entire family. Taking portraits of the dead. In this era of instant photography, when every phone is also a camera, and our computers have cameras as well, it is hard to believe that these photographs would have been an expensive luxury for many families. But the money was found, somehow. 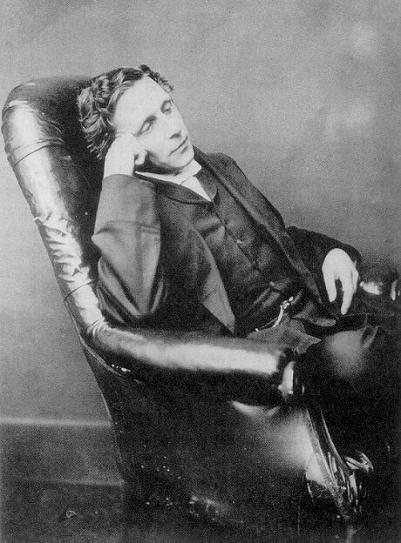 The Victorians were sentimental, in a way that 21st century people are too sophisticated to understand. These photos survive because they were treasured, and not because it was fashionable to have portraits taken of the deceased. 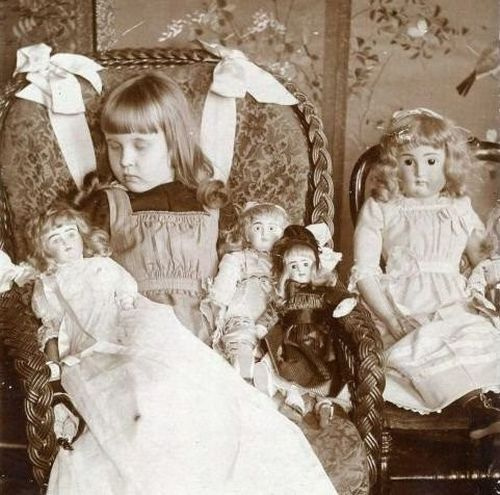 The deceased were often posed as if they were sleeping. 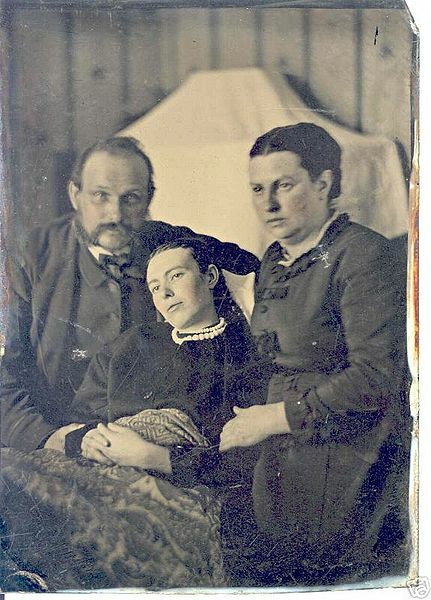 As a metaphor for a Steampunk writer, I believe these post-mortem photographs could represent family connections, the strength of love between family members, or even as an analogy for the briefness of mortality. Photography was still an innovative technology. This mixture of Science and raw Emotion can be a very powerful writing technique. 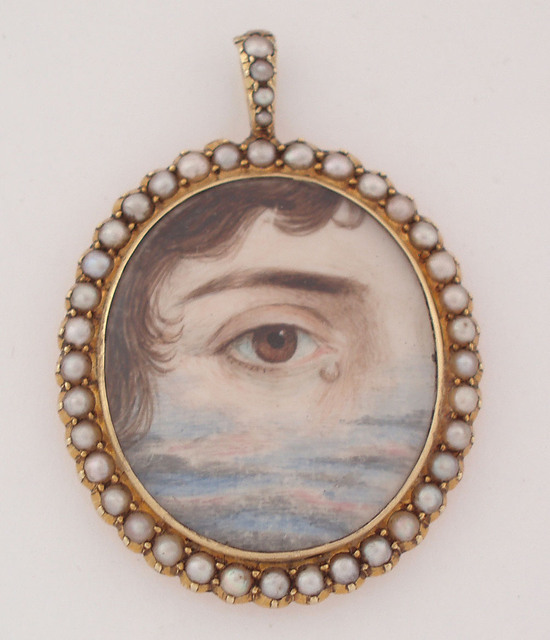 1800-1820 Mourning miniature, an eye portrait with a tear and clouds, with pearls to symbolise more tears. Mourning jewellery was big business during the Victorian era. It wasn’t only jet jewellery that was all the craze, there was a whole range of different types of memento jewellery. These items were full of symbolism, which makes them perfect for writers to use as metaphors and analogies. 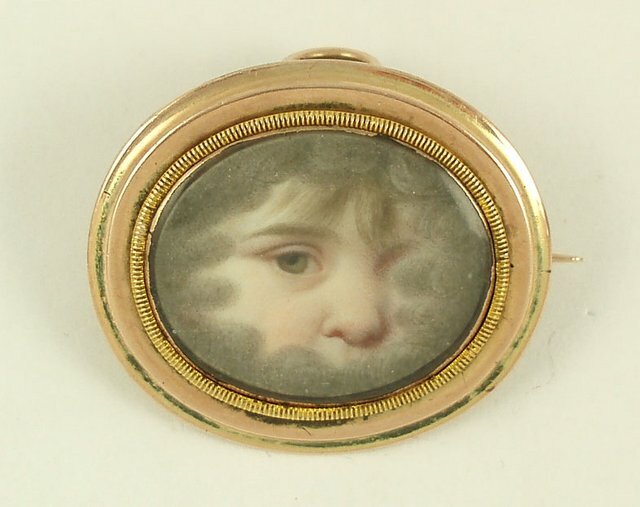 Miniature painted on ivory of a child’s eye in the clouds. Most likely a mourning brooch. Eye Portrait Jewellery: This type of memento wasn’t limited to the Victorian era, but it was a popular trend. The eye surrounded with pearls (symbolising tears), the eye surrounded by clouds (in Heaven), or an eye with a single tear, all pointed to the eye belonging to someone who was deceased. When this jewellery was worn as a memento of a secret love, those details were not included. These miniatures were usually framed in lockets or brooches, but they could be incorporated into bracelets as well. These are potent little packets of significance – a great treasure to a writer wanting to layer a characterization with extra meaning. Mourning locket, made of gold, hair work, seed pearls, made by John Wilkinson Jeweller; Silversmith, Leeds, England, circa 1826. In the Collection of the Powerhouse Museum. 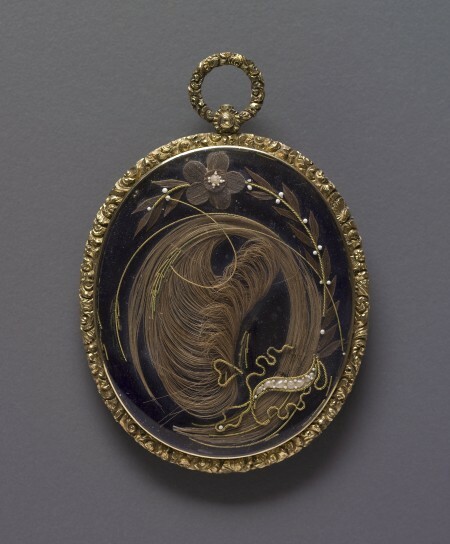 Hair Jewellery: This is something that seems very strange to modern eyes, but in the Vicotrian era, hair jewellery was all the rage. Women kept special containers on their dressing tables to collect their hair. People gave each other lockets of hair as mementoes. 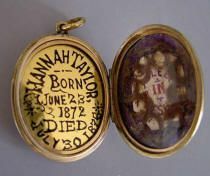 When a person died, lockets of hair were distributed to their friends and family as keepsakes. Often this hair was used to create all types of accessories. I can’t help but wonder if woven hair bracelets were itchy. If you have read Little Women by Louisa May Alcott, you will see the evidence of hair as keepsakes; Beth wants to cut her hair and give it away when she thought she was dying, and the mother treasures a Christmas gift of a brooch made from hair from every member of her family. Human hair has a huge significance in witchcraft and fairy tales; it nearly has as much cultural significance as blood. In Victorian era narratives, Jo from Little Women sells her hair, as does Della from O. Henry’s The Gift of the Magi, and they sacrifice their ‘beauty’ for love. 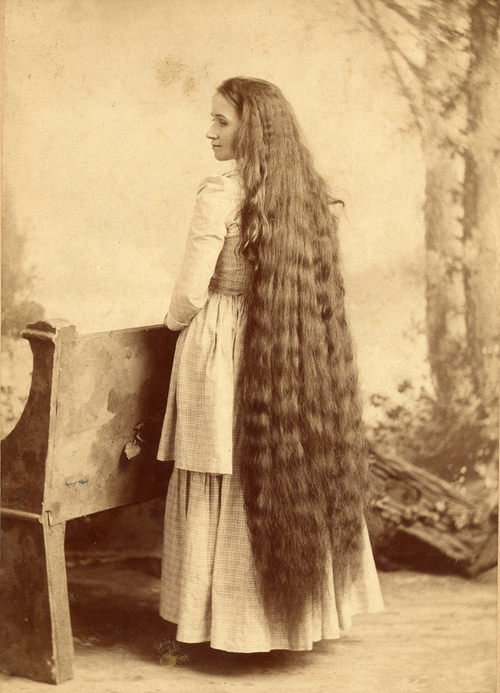 Long hair was much admired as a feminine trait, so the cutting of hair was considered quite a big deal. It doesn’t take much for a writer to see that the cutting of hair can also be considered a metaphor for cutting links or chains. Jewellery is highly personal. When you are ‘cooking up’ a character, particularly a female character (though Victorian men did wear jewellery), you should try to visualise what sort of jewellery she is wearing. Why is she wearing it? It might simply be for show, but it is more interesting if the jewellery is worn for sentimental reasons. It can tell you a lot about that character, straight up. That ring was a gift from her beloved grandmother, just before the old woman died; when she feels discouraged, she rubs it for luck and strength. For a male character, that tiepin was his first purchase with his first pay cheque, as a promise to himself to try for better things. Keepsakes are just that … so what do they mean? That is the real question you need to answer for your audience.